Before getting my tummy tuck surgery, I researched everything about the procedure. And yet, I was still surprised by the significance of my tummy tuck scar, even after having seen photos in the office and online. The increased pigment in my skin means that I am prone to scarring and hyper pigmentation. While there are a number of laser treatments available to minimize the appearance of scarring. Tannaz from CosmetiCare recommended ClearLift. Even before I had my first consultation with CosmetiCare for a tummy tuck, I knew what to expect with regards to recovery. My medical background and inquisitive personality meant that I researched everything about the procedure. I even went so far as to watch tummy tuck surgery videos. Dr. Von Maur had prepared me well for the surgery. And yet, I was still surprised by the significance of my tummy tuck scar, even after having seen photos in the office and online. The increased pigment in my skin means that I am prone to scarring and hyperpigmentation. While there are a number of laser treatments available to minimize the appearance of scarring. Tannaz from CosmetiCare recommended ClearLift. This post is part of a sponsored campaign with CosmetiCare. 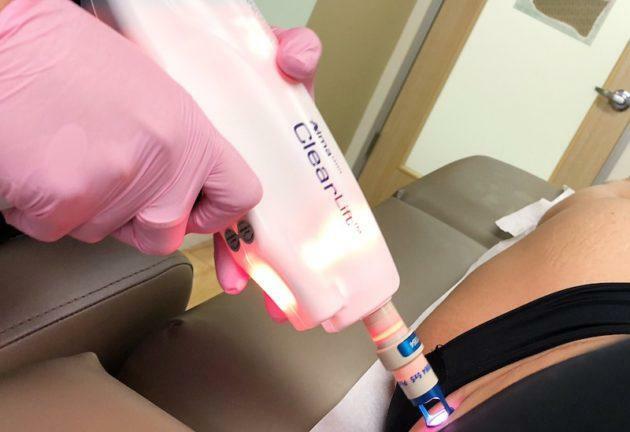 ClearLift laser is a non-surgical, skin resurfacing procedure used to treat everything from wrinkles and age spots to stretch marks and scars. 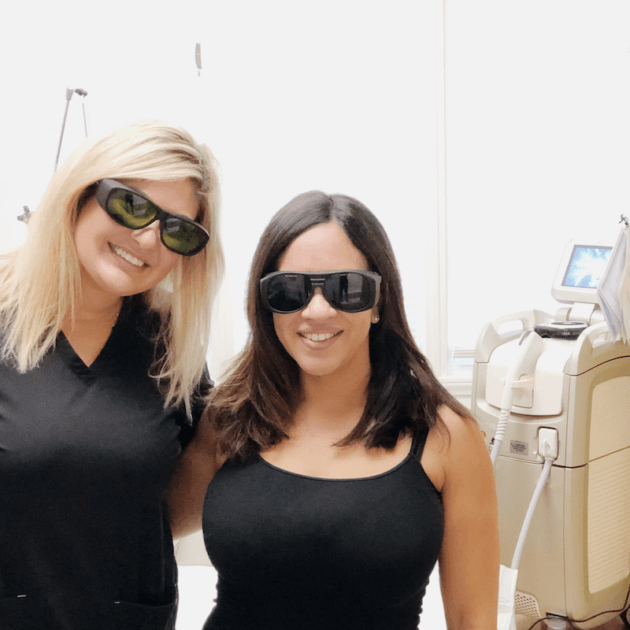 ClearLift utilizes fractional laser resurfacing. The laser uses 1064 Q-switched energy to reach the deepest layers of the skin to remove imperfections. Working from the inside out, the laser provides results that mirror traditional resurfacing without damage to the surface of the skin. What is the Downtime Associated with ClearLift? One of the more compelling reasons to try ClearLift for skin resurfacing is how quickly the procedure can be completed. One treatment (one area) takes about 20 minutes and is popular for being completed during the lunch hour. Since ClearLift works from the inside out, there are no burns or scars to care for and hence no recovery time. Since there is no surface damage to the skin, there is no risk of infection. ClearLift is completely painless. 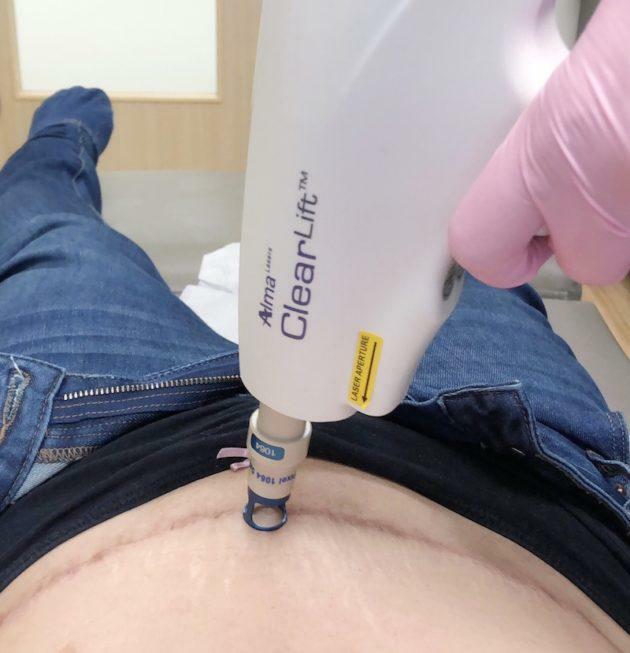 I still do not have much sensation in the area of my Tummy Tuck scar, but Tannaz assured me that generally speaking, discomfort is minimal to none during ClearLift treatments. It is possible to feel warmth or discomfort in the days following a ClearLift treatment, although this is not common. Am I a Candidate for ClearLift? Unlike many lasers, ClearLift is unique in that it can be used on all skin types, tones, and textures. I highly recommend a consultation, because it was during that time when Tannaz recommended ClearLift over Vbeam to address my surgical scar. What types of Skin Conditions Can ClearLift Treat? ClearLift can be used to treat a variety of conditions. Remember, it is crucial that you consult with a laser specialist before undergoing a treatment like ClearLift. ClearLift results can typically begin to be seen after the initial treatment. I highly recommend taking an initial photo of the area before receiving your first treatment, in order to see how ClearLift is working to resurface your skin. Individuals will vary on the number of treatments needed to achieve results. However, most people see more dramatic results after three to six treatments. What are the Risks Associated With ClearLift? ClearLift is a safe, gentle laser resurfacing treatment. As such, you will not see burns or abrasions as is common in other resurfacing treatments. While there are no real risks, ClearLift may not be for everyone. As such, it is crucial that anyone seeking out laser treatments receive an initial consultation. Are you considering laser skin resurfacing? Visit ComsmetiCare for a consultation with one of their skilled laser specialists. If you do decide to book a treatment, be sure to mention Caryn100 to save 10% off all treatments, including ClearLift.